Hotels are lovely, but if you ask me; the best way to relax when you're on vacation is to rent your own place. Whether it's an apartment or condo, having your own place to call "home" whilst away from home makes all the difference. 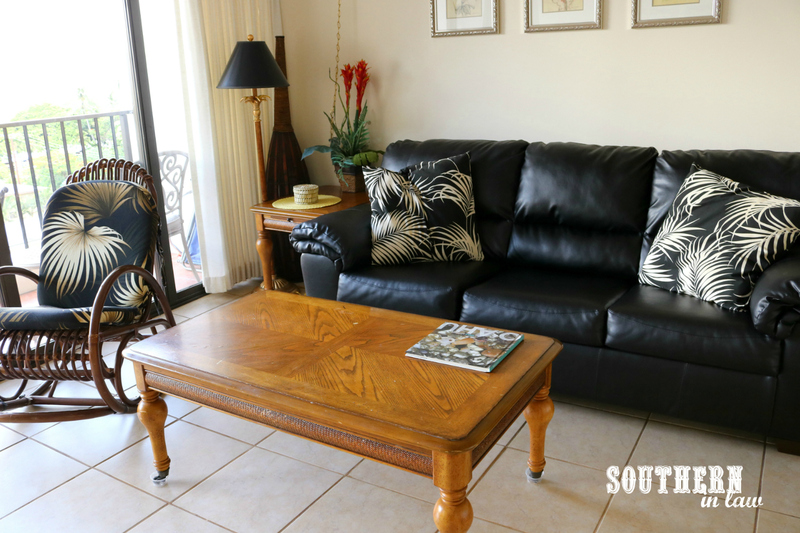 You can unpack all of your belongings, enjoy long lazy mornings, experiment with local produce or cook your own meals in your kitchen and unwind without housekeeping knocking on your door. Disclosure: We stayed as guests of DARMIC - but genuinely loved staying there and thus, all of these words come completely from our brains and have not been influenced by the company in any way. This is NOT a sponsored post! 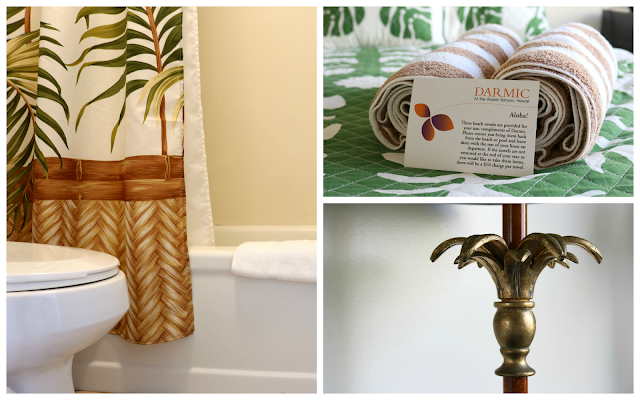 Darmic at The Waikiki Banyan was actually the first stop of our trip. 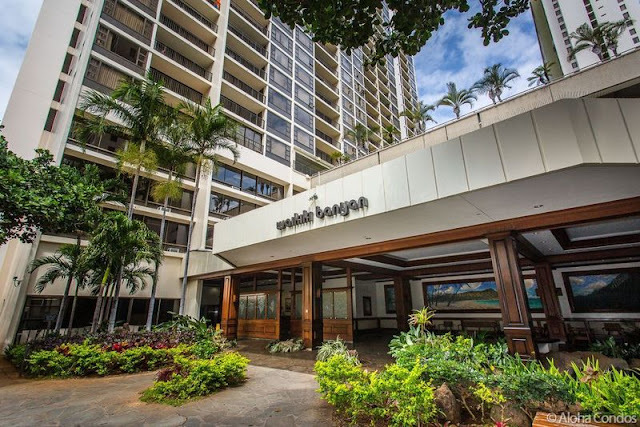 We got off the plane, picked up our rental car and drove over to the Waikiki Banyan where we met Colin, the manager. Colin jumped in the car and showed us where to park (secure parking is hard to find in Waikiki - and at Darmic it will only cost you $10 for your ENTIRE STAY... not $30+ a night like most other places) and then took us up to our apartment. The apartment was super cosy and homely. 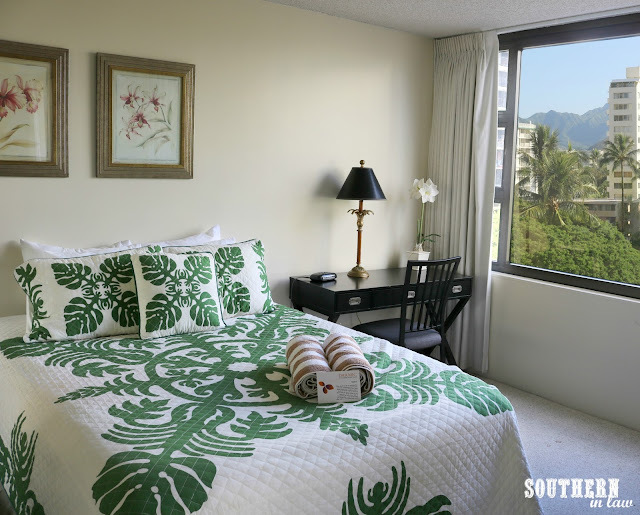 We had a full kitchen, a dining table, a lounge area, a bedroom with desk and television and a full bathroom - as well as a cute little lanai (or balcony) with a view to the mountains. 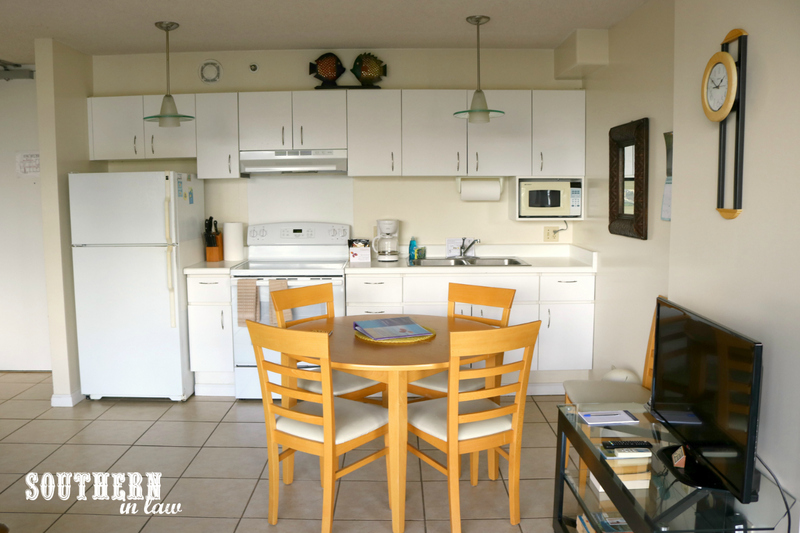 We had everything we needed and more - from beach towels and a beach umbrella to all the cutlery and cooking equipment we'd need - even a rice cooker and slow cooker if we were so inclined. But my favourite part of all? The view from the bedroom. It was fascinating watching the view change from day to day and moment to moment. You'd see the clouds forming over the mountains in the distance and getting darker and heavier before rain fell on the North Shore - only to have them mysteriously disappear and a rainbow appear in their place. It was beautiful and felt like we got the best of both worlds - the mountain view and Waikiki's beautiful beaches, city nightlife and seriously awesome shopping. The location of Darmic was perfect. We were just a five minute walk from the beach - and we didn't have room keys or key cards to take with us (the rooms have combination locks - so you don't have to worry about taking a key with you or having it lost or stolen) so it was just a matter of putting on our swimsuits, grabbing our towels and walking down to the beach. 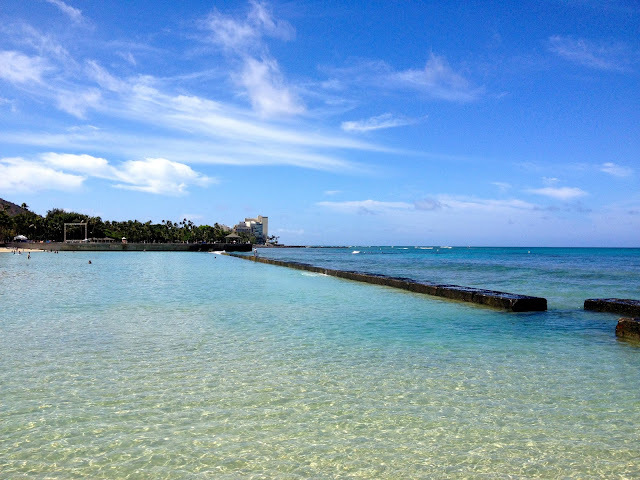 Speaking of the beach, I thought I'd give you a run through of our favourite Waikiki beaches. 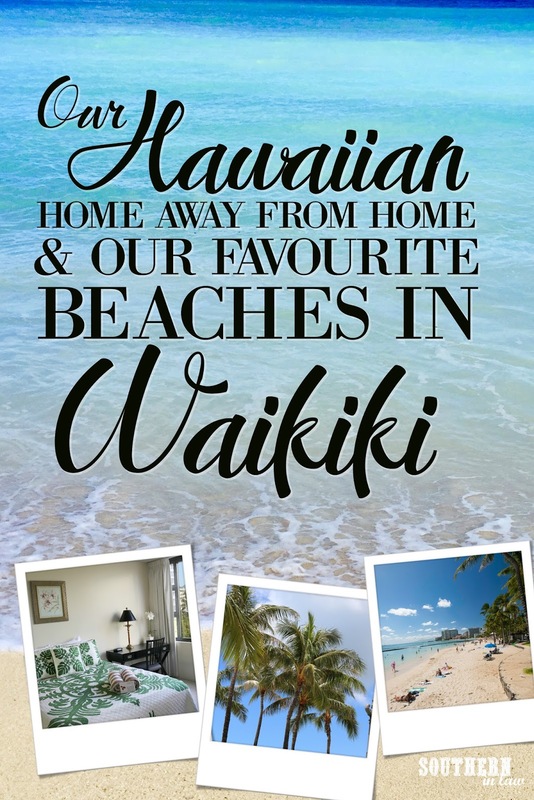 Now... take note, we're not surfers and we're not paddleboarders... so these beaches are our favourite for simply relaxing and lazing about in the water. And when I say lazing, I mean it. 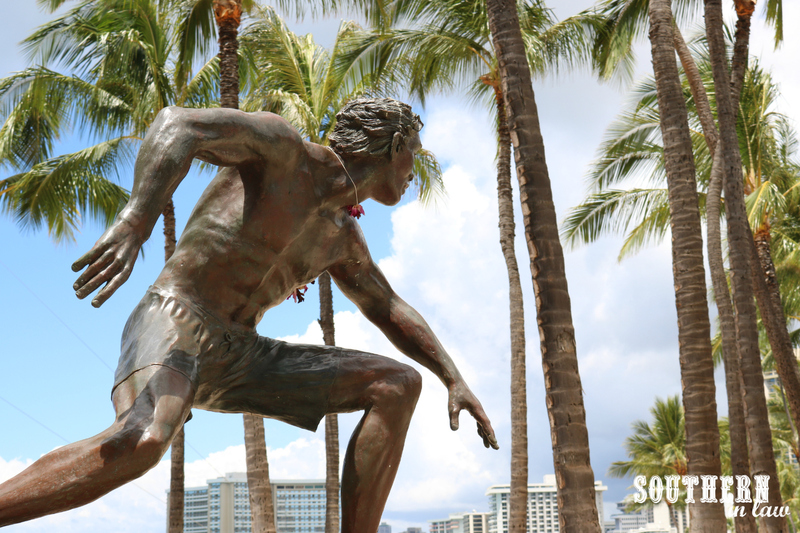 My number one tip for Waikiki's beaches? Stop by an ABC Store (they are on EVERY block/corner - you can't miss them) and grab one of their ring floats. Ours cost $4 and it was perfect for bobbing along in the water and relaxing. 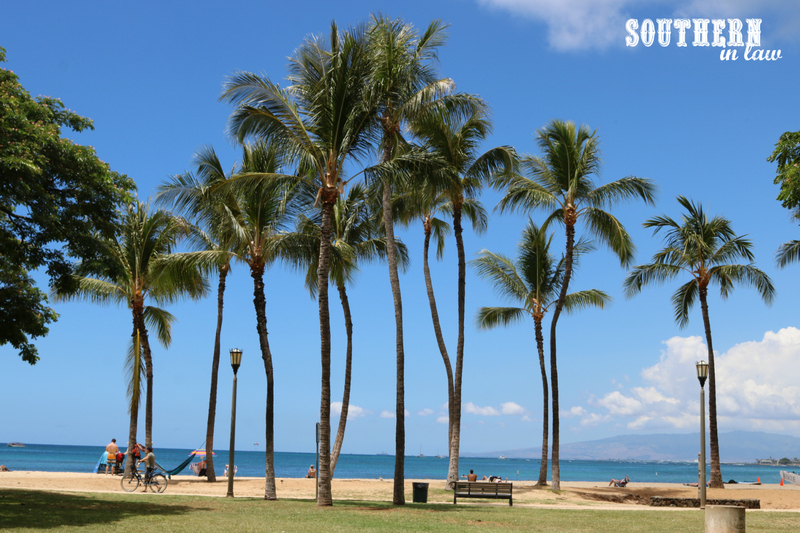 Kuhio Beach Park was our favourite beach of all. It's clean, there aren't sharp rocks under the water and it's probably the safest beach to swim at thanks to the Waikiki Beach Wall. It's similar to tidal pools like we have in Australia - the waves come in, but you're kind of contained within the area thanks to the beach wall. That makes it safer for little kids as you don't have to worry as much about them being washed out to shore - and they'll know the limits as they can see the wall (unlike a regular beach where you can say "don't swim too far" but "too far" is kind of a variable distance as you never look as far out as you are while you're out there). It's relatively busy - but not so much that you're swimming shoulder to shoulder - or even within a few metres of eachother. We always had plenty of space and there was always plenty of stuff to spread out our towels and laze about on the shore too. It's busy, but it doesn't feel that way.... not like Bondi Beach in the middle of summer. 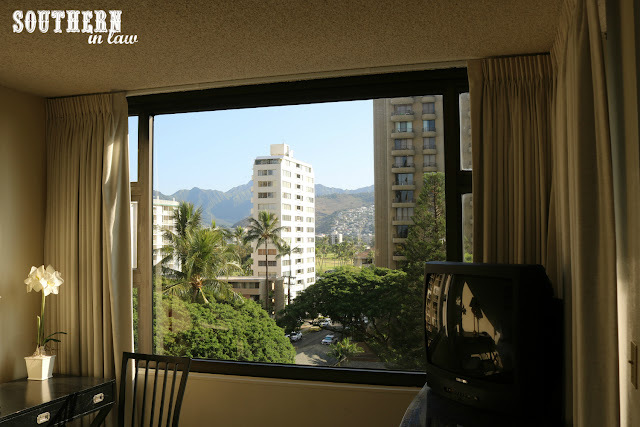 Kuhio Beach was the closest to Darmic - we headed straight down on Ohua Avenue, crossed the road and we were there. 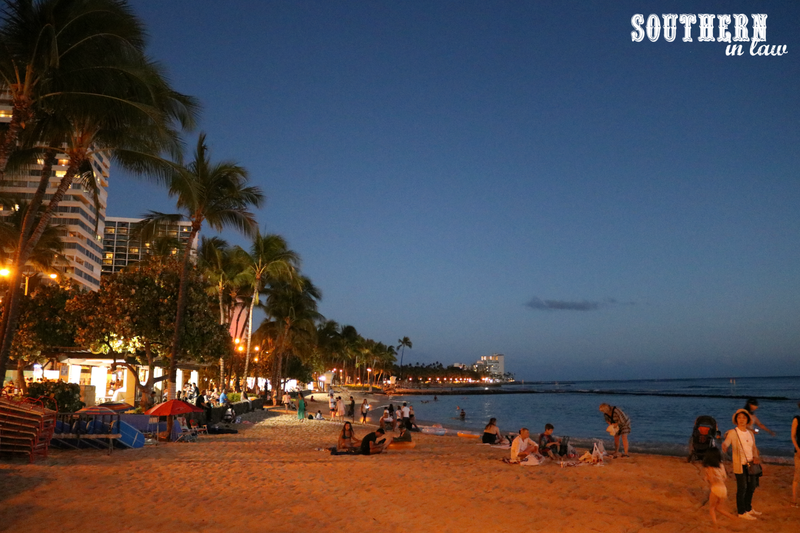 There are also plenty of shops and restaurants to browse on Kalakaua Avenue if you're feeling peckish or need a break from the beach. Kuhio Beach Park is also home to a free hula performance on Tuesday, Thursday and Saturday evenings at sunset. It's a good idea to get their early to get a spot to sit (note: you will be sitting on the ground so if you're a little precious about sitting on grass, bring a towel or something to sit on) - but there are always people moving about so you'll find a spot even if you come late (or you can stand at the back). This is the perfect way to hear some traditional songs and see some traditional dances without paying a single cent. The atmosphere is amazing and the performers are brilliant. On the night where I took photos, we watched an entire family perform; with Mum and Dad singing and dancing and their daughter dancing as well. 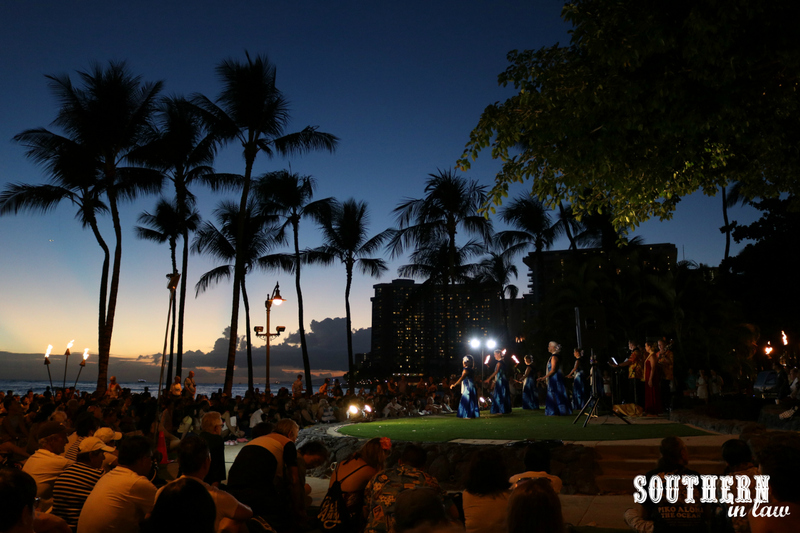 It was fascinating to here and see how hula and traditional culture and stories were passed down from generation to generation. But I'll have to tell you more about that another day - because I think I've dumped enough words on your today! So tell me, what are you like at the beach? Do you like to laze about? Swim laps? Sunbake? Read a magazine? Would you prefer to have the beach all to yourself - or join in the summer fun with everyone else?